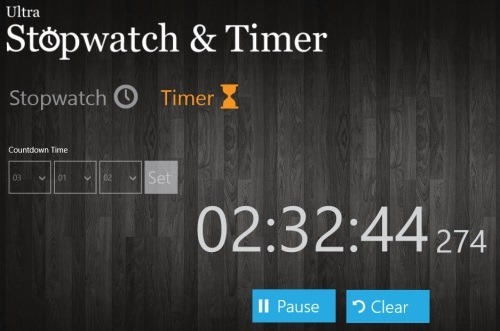 Ultra Stopwatch & Timer is a free Windows 8 stopwatch app that is available under ‘Tools’ section of Windows 8 app store. 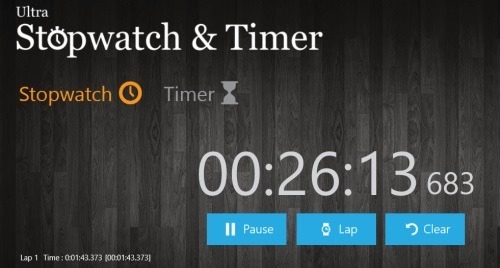 Here, in this stopwatch Windows 8 app, you will find an easy-to-use stopwatch along with a simple timer. The stopwatch available in this app facilitates with options such as pause, resume, lap time features. You can also set countdown time and let the timer run in the background while you are doing your work at the front. You can also enable the toast notification for your countdown timer. Also, there is an option to pin to start your favorite timer settings. Now, why is the app called ‘Ultra’? Well.. the stopwatch in the app shows hours, minutes, and seconds along with ‘Milliseconds’. The stopwatch screen has a very intuitive interface where you will find Start / Pause, Lap, and Clear buttons. You can easily start the stopwatch and continue working with your important project. The stopwatch keeps on running in the background. Well.. you can also disable the option to run the watch or timer in the background. Let me quickly point out the features of this Windows 8 stopwatch app. Comes with a stopwatch and timer. Shows hours, minutes, seconds, and milliseconds. Lets you set countdown timer. Lets you pin to start your favorite countdown timer settings. Features with lap time in stopwatch. Lets you enable the toast notification for countdown timer. Well.. I really liked this stopwatch app for Windows 8 where you can see hours, minutes, seconds, and milliseconds of the running time. You can enable the settings to get notification for your countdown timer. It’s very easy to use. Also, check out our posts on Stop Watch Apps, World Clock Apps, and Alarm Clock Apps. Click ‘View in Windows Store’ to open the app in its store. Install the app and move with further downloading steps. In short, Ultra Stopwatch & Timer is a good utility tool that is very useful when you want to complete your project in a specific time period. Go ahead and download Ultra Stopwatch & Timer app in Windows 8 now.